By Andi B. Meltzer, M.A. No one escapes the inevitable experience of loss. Sadly, most of us haven’t been taught how to handle our own grief, let alone others’. As a result, kids tend to be particularly neglected in helpful support. Here are a few tips. Go first. Keeping the conversation age appropriate, tell the truth about your own feelings about the lost hopes, dreams, and expectations of the future, for example. Talking about your pain will demonstrate the important skills of honoring and expressing emotions and will help your child feel safe to open up about his or her own feelings. If you find it difficult to share your own grief, then please reach out for assistance in resolving whatever is left emotionally unfinished for you as a result of the end or change in a relationship. You can’t give what you don’t have! If you hold onto unresolved issues, then, sadly, you’ll teach the child how to hold on to unresolved issues. After going first, be patient, and don’t pressure the child to talk. You’re planting seeds at this point. When the child begins to talk, listen with your heart, not your head. Imagine you’re a heart with ears. Allow all emotions to be expressed, without judgement, criticism, or analysis. Grief is emotional not intellectual. There is nothing wrong with the child’s brain; rather, the issue is there is a pain in the heart that needs to be acknowledged. Avoid the trap of asking your child “What’s wrong?” because he or she will automatically say, “Nothing.” Don’t respond to your child’s feelings with unhelpful words such as “We’ll get a new dog Saturday,” “Here, have a cookie and you’ll feel better,” “Grandpa is in a better place,” “You need to be strong for your sister,” “It just takes time.” You may be desperately wanting to make your child feel better, but your child is likely to hear the message that he or she shouldn’t feel bad and that if he or she does, it’s wrong and you don’t want to hear it. The child will sense your judgement or discomfort and will promptly shut down, which is the beginning of stuffing feelings. Therefore, never say, “Don’t feel sad” or “Don”t be afraid” because sadness and fear, the two most common feelings attached to loss of any kind, are essential to being human. 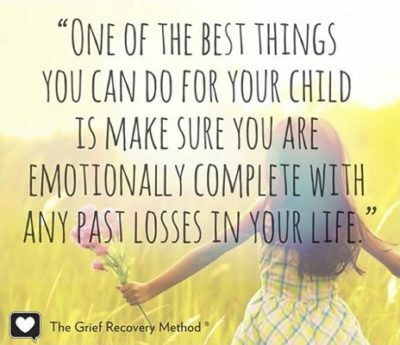 If you have more than one child who is mourning, please remember that each child’s reaction is unique and that each has a unique relationship to that loss. So, don’t compare their experiences or feelings of grief. Reach out if you’d like more information or to register for an upcoming 6 week Helping Children Deal With Loss® class, which is designed for adults to learn how to help their child. To move past your own personal loss, please register for the 8-10 week Grief Support Group® or work with me individually for the one on one program.